Hello, yes it’s me again. Two posts in one day!!! As I previously mentioned I have magnets and cards for sale at the Bold Artiste. Now, what I didn’t mention is that their GRAND opening is this upcoming Friday from 5pm until 11pm. Just in time for the James Street Artcrawl! They are located at 6 Bold Street. Now I know there are some of you out there who have NO idea what the James Street Artcrawl is, well here’s the gist: It’s a night of art openings on a street called James Street in Hamilton Ontario. It happens every second Friday of the month (December 9th, January 13th, February 10th, etc…). It’s a night where artists, art enthusiasts and the curious venture out and gallery hop or ‘crawl’ to see how creative Hamilton can be. Galleries located on this stretch throw opening receptions for new exhibitions. Sometimes there may be a few ‘old’ exhibitions still up from the previous art crawl, which is fine especially for those who missed the previous crawl and/or those who really enjoyed the art. All in all it’s an interesting and inspiring night. Also along James Street there are yummy places to eat and to purchase warm drinks…very much appreciated on chilly winter nights when it’s terribly hard to motivate oneself to brave the cold! Having said all that, I hope to see some new faces out on the town. Back to the Shop, the Bold Artiste is a great place to find that special gift for someone who appreciates the arts. There are a wide variety of artists represented at the shop with fantastically creative items that have a price point for everyone. It’s true. I am curious to see what items I bring home with me this Friday…I’ve already spotted a few Christmas presents for friends and family. 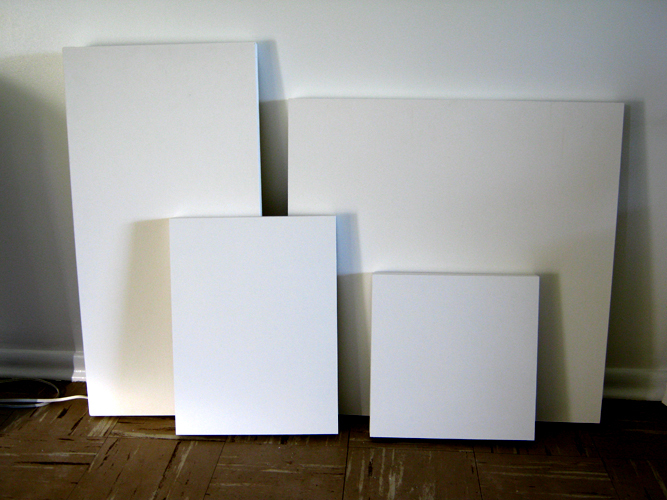 Oh and on a personal side note, I am starting four, yes four new paintings today. What an endeavor but it will be fun…promise. Stay tuned for photo updates! p.s. a sneak peek! Not much to look at NOW but they will be!